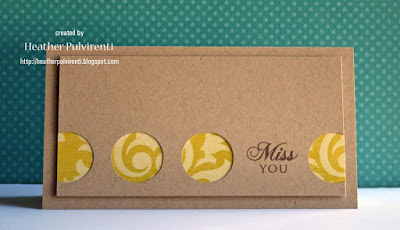 Love it - never occurred to me to put paper behind cut out circles - inspired! Wow! this card is amazing! Love it! Eeek!!! So cool! Love how you used the sketch! Such a fresh look. TFS! very interesting.. love how you've made a simple layout so interesting!! wow!! this is certainly out of the "circle"! Great idea!! Very pretty! I need to try this technique more often, I love it! What a great idea. Going to have to try this. Good way to use the endless amount of DP I have. Wow! This is incredible. So stylish. I love how you changed up the sketch just a bit. This is so great Heather!! You are so clever and talented. Love this sketch and your take on it is absolutely fabulous! Thanks for sharing it with us. I love this Heather! So clean and fresh!